This page is about Falls Road in Belfast, Northern Ireland. For other uses, see Falls Road (disambiguation). 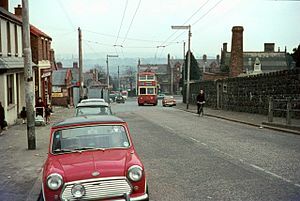 Falls Road looking towards Divis flats and the city centre. 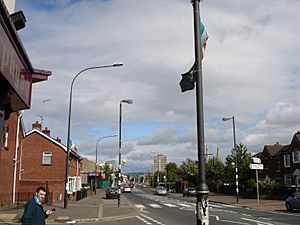 The Falls Road (from Template:Etymology/lang túath na bhFál, meaning 'territory of the enclosures') is the main road through west Belfast, Northern Ireland, running from Divis Street in Belfast city centre to Andersonstown in the suburbs. Its name is synonymous with the republican community in the city, whilst the neighbouring Shankill Road is predominantly loyalist, separated from the Falls Road by peace lines. The road is usually referred to as the Falls Road, rather than as Falls Road. It is known as the Faas Raa in Ulster-Scots. The Falls Road derives its name from the Irish túath na bhFál, an Irish petty-kingdom whose name means "territory of the enclosures". This territory was roughly the same as that of the ecclesiastical parish of the Shankill, which spanned a large portion of modern-day Belfast. The Falls Road itself was originally a country lane leading from the city centre but the population of the area expanded rapidly in the 19th century with the construction of several large linen mills. All of these have now closed or have been repurposed. This original area, which was centred on the junction of modern-day Millfield and Hamill Street on what is now Divis Street, was known as Falls and lent its name to the road, which had previously been called "the Pound". The housing in the area developed in the 19th century and was organised in narrow streets of small terraced housing. Many of these streets were named after characters and events in the Crimean War (1853–1856) which was occurring at that time. These included Raglan Street (named after Lord Raglan, commander of British forces in the Crimean War), Alma Street (named after the Battle of Alma), Balaklava Street (named after the Battle of Balaklava), Inkerman Street (named after the Battle of Inkerman), and Sevastopol Street (named after the Siege of Sevastopol). 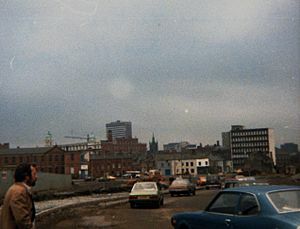 By the 1960s the buildings in the area had decayed considerably and the Belfast Corporation introduced a major development plan which involved wholescale demolition of much of the area and its replacement with a series of flat complexes. The high point of this redevelopment was Divis Tower, built on top of the historic district formerly known as the Pound Loney. The Falls Road district can be roughly divided into three sections. The Lower Falls which includes Divis Street starts near the city centre and continues to the junction with the Grosvenor Road. The middle Falls district centres on Beechmount. The Upper Falls starts about the Donegall Road and continues into Andersonstown. 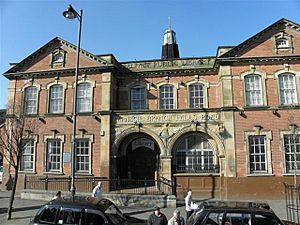 Falls Road Library, opened in 1908. Since the 1960s there has been a substantial revival of traditional culture in terms of Irish language, dancing and music. These are all showcased during the Féile an Phobail, an annual festival of Irish culture. Cultúrlann McAdam Ó Fiaich, known colloquially as the Cultúrlann, is an Irish language and arts centre based on Falls Road. The centre also houses Irish language bookshop An Ceathrú Póilí. One of three Carnegie libraries built in Belfast is situated on Falls Road. It opened on 1 January 1908 and is the last Carnegie library in Belfast still functioning as a library. In the Lower Falls area is located Dunville Park, which was first opened in 1893 and has recently been refurbished and includes football pitches. In the Upper Falls area is located the Falls Park which was established in 1873. This park contains a wide range of sporting facilities. In the Upper Falls area are located two large cemeteries. The first is Belfast City Cemetery which is located at the junction of the Falls Road and Whiterock Road. This is a municipal cemetery maintained by the Belfast City Council. At the junction of the Falls Road and the Glen Road is located the Catholic Church-run Milltown Cemetery, synonymous with Irish republicanism. The Lower Falls area previously had many linen mills. These have either been demolished or converted for other purposes. One of these is Conway Mill, in Conway Street (named after the Conway family, a noted generous family of the Clonard Area). Originally a flax spinning mill, it now houses a community enterprise of small businesses, art studios, retail space and education floor. 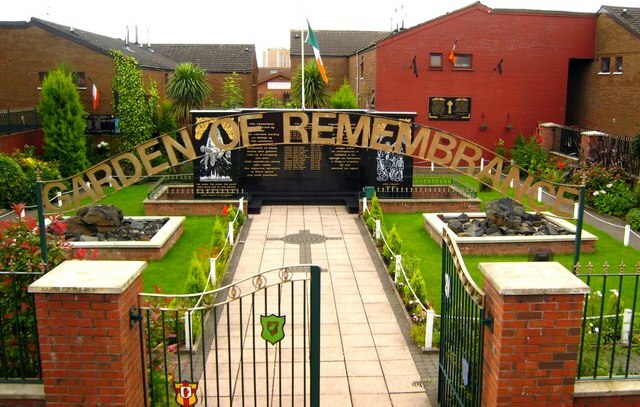 Garden of Remembrance, Falls Road. Frederick Douglass mural on the 'Solidarity Wall', subsequently repainted. Falls Road, Belfast Facts for Kids. Kiddle Encyclopedia.